In 2016, a study carried out by the Organisation for Economic Co-Operation and Development (OECD) found that for literacy in the developed world, England ranks dead last. The same study also stated that for numeracy in the developed world, England ranks second-to-last. Even among graduates from English universities, the OECD study found, one in ten had literacy or numeracy skills that were classified as "low". These results are astonishing, not to mention shaming. They reflect decades of misdirection in British education, including the misdirection of resources. Understandably, successive governments complain about a lack of resources. But all of those laments only serve to highlight the strangeness of Britain's latest priorities in funding education. This past weekend it emerged that last year the British government funnelled £20 million to Palestinian schools. A review by the Institute for Monitoring Peace and Cultural Tolerance in School Education (IMPACT-se) found that these revenues go towards funding a curriculum which omits teaching peace, promotes the use of violence -- specifically jihad -- and encourages martyrdom. An analysis of the textbooks used in Palestinian schools funded by the UK government -- using UK taxpayers' money -- found that these textbooks, which come from the Palestinian Authority (PA), "exerts pressure over young Palestinians to acts of violence." "During the first Palestinian uprising, Palestinian youths used slingshots to confront the soldiers of the Zionist Occupation and defend themselves from their treacherous bullets. What is the relationship between the elongation of the slingshot's rubber and the tensile strength affecting it?" Another textbook, which is meant to be used for teaching arithmetic to 9-year-olds takes a highly local approach to the matter. Math lessons as provided by the PA -- courtesy of the UK government -- teach Palestinian children addition by asking them to calculate the number of "martyrs" in various Palestinian uprisings. Elsewhere, the study found that social studies books included images of children in their school rooms with an empty desk fitted with a sign reading "martyr". Repeatedly the textbooks refer to the "Occupation", to "Zionist Occupation", "Zionists" and much more, all of which perpetuates the notion that Israelis are "invaders" and "oppressors". In other words, these textbooks are clearly and consistently intended to indoctrinate a new generation of Palestinian children to hatred of their neighbours. Any government genuinely interested in promoting peace would withdraw funding from any entity -- wherever in the world it was -- which taught violence as such a core part of its curriculum. The British government, however, has long been strangely shameless when it comes to funding the Palestinian Authority. The British government, for instance, hides behind the claim that the PA's authorised textbooks for use in Palestinian schools have got better in recent years. In fact, this IMPACT-se report find precisely the opposite. Last year, the PA launched a much-vaunted new school curriculum for children in grades 5-11. Just last week the Minister of State for International Development, Alistair Burt, stated that "all of their [the PA's] schools in the West Bank are using the revised 2017 PA curriculum." The IMPACT-se investigation revealed, however, that "radicalization is pervasive across this new curriculum." And not just pervasive, but pervasive "to a greater extent than before." The study found that in textbooks which pretend to be teaching "equal rights'", girls are encouraged to sacrifice their lives. A textbook aimed at 5th grade children (that is, children aged 10) teaches that "drinking the cup of bitterness with glory is much sweeter than a pleasant long life accompanied by humiliation." Another textbook urges that "Giving one's life, sacrifice, fight, jihad and struggle are the most important meanings of life." "Our support is helping around 25,000 young Palestinians go to school each year. The UK government strongly condemns all forms of violence and incitement to violence." Well, the UK government clearly is not so opposed to "all forms of violence and incitement to violence" that it isn't happy to continue to use millions of pounds of UK taxpayer money to assist the PA in radicalising and inciting Palestinian children. 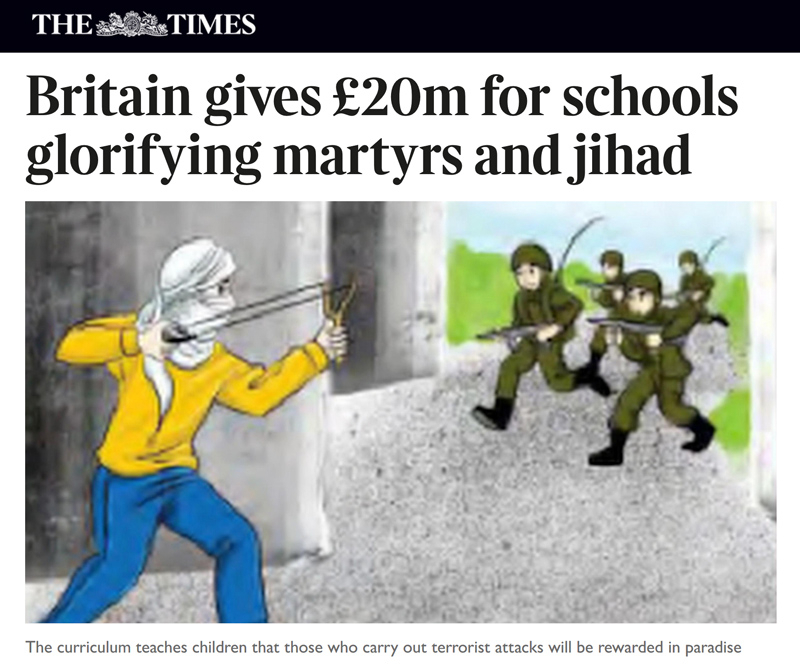 Pictured: A screenshot from the Sunday Times article exposing the British government's funding of a Palestinian curriculum which promotes the use of violence -- specifically jihad -- and encourages martyrdom. The Department for International Development also announced that it was now "planning to conduct a thorough assessment of the Palestinian curriculum and evidence". It added that "if we find evidence of material which incites violence, we will take action." Evidence has been given to it in abundance, not just now but for years. This is the true scandal for Britain: that while the UK government fails to pump the resources needed into helping young British children to grow up literate and numerate in Britain, it pumps millions of pounds into the Palestinian Authority to make sure that young Palestinian children think that a career of violence is a career worth pursuing. While failing to help British children grow up, the UK government helps Palestinian children to blow themselves up. It is a horrible legacy for any country, but for Britain, a shameful one. There was an article in a national newspaper recently about several Muslims who were employed by the Home Office being convicted of selling citizenship to illegal Muslim immigrants. Also there was the barring from the UK of several conservatives namely Pettibone and Southern. Pettibone was informed of her ban by means of an official Home Office letter that did not appear to be composed by a person who was a native English speaker. I understand that many UK Government Departments are stuffed with Muslims. Is it any wonder that the UK has the appearance of lunatic asylum hell bent on national suicide? The British government is using pure hypocritical strategy to hide their hatred towards Jews, which is known as antisemitism. It is not open but being promoted via the palestinian proxies to spread this hatred towards the Jewish state for generations of Arabs. This is as clear, as the BDS movement in the name of the so-called "oppressed". They are perfectly aware how the money of the patient and submissive British taxpayers is being used by the palestinians. Unfortunately Britain isn't alone, as flooding Europe with islamic jew haters by western governments means supporting jihad and all associated terror and violence. Why does this not surprise me? We give away 0.07 % of our GDP away in foreign aid, break our own immigration laws in UK, fund terror. Amber Rudd our Home Secretary allows returning ISIS terrorists back into the UK even giving these terrorists accommodation and housing at taxpayers expense. Allows untold numbers to enter the UK who have not paid any taxes in the UK to use the NHS, hire translators at schools and in government to make these foreign invaders lives easier. HMRC is now stuffed full of immigrants who can barely speak English and has become so inefficient in collecting taxes it is a joke. Our Charity sector is being used to fund terrorist organisations, mass immigration etc etc. No wonder education standards in the UK are among the lowest in the developed world. The government is so incompetent and does not even have any plans to rectify this situation. A revolt is around the corner for this gross incompetence by both our MP's and the Civil Service. We are headed for rebellion on a gigantic scale soon against those who govern the UK and soon. I can only half agree with Douglas Murray here. Yes, regarding the vile propaganda being paid for unwittingly by the British taxpayer, I'm with him all the way on that. I can't agree with this bit: "...the UK government fails to pump the resources needed into helping young British children to grow up literate...."
This is not an either/or question. 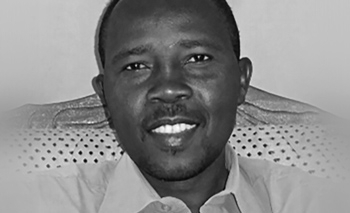 Both the Department for International Development and the Department of Education are bloated, politicized and wilfully extravagant. DfID actually has a ring-fenced budget, so makes a point of splurging every single penny that comes its way. Neither department should exist in its current form. The problems in Britain's education system are emphatically not caused by a lack of funding. The Department of Education is itself a very large part of the problem and is a haven of indoctrination, much like the kind exhibited by DfID. It's happening in America as well, in that American History is revised in textbooks and non-classical education. By non-classical education, I mean the outright omission of the 3 R's (reading, writing and arithmetic), the foundation of basic education. These subjects have been reduced in time spent on them and supplanted by such non-intellectual subjects as global warming, social justice, etc. Check out the standing of America's students in literacy and numeracy against the world's students. I think it was Pew Research, but the studies show American students slipping to number 38 in numeracy and 32 in reading comprehension. When I was going to school in the 1950's and 1960's, we either lead the world in student performance or were in the top three. The purpose is deliberate; an uneducated and illiterate populace is easier to manipulate. Is all of Europe going to be completely lulled to sleep...again? Thank you for this article. I pay UK taxes although I live in Israel. It is truly galling that the UK provides this funding without any pre-conditions on how the funds are used, and without any supervision. This is false do-gooding. It helps no-one, especially not Palestinian children who deserve to receive an education that helps them develop their minds and achieve independence, which could in turn bring independence to the PA, instead of relying on hand outs ad infinitum. The UN and UNESCO have not done the Palestinians any favours either by keeping them in perpetual refugee status. The way things are, the UK is aiding and abetting the PA in abusing and sacrificing its children. It totally baffles me how the UK and other democratic societies are so excited to sponsor and support these terroristic school studies. It is like they are setting themselves up to be attacked but means of showing them acceptance of their violence and so forth. But surely the Palestinians will need to improve on their chemistry, before they get here. Their maths and geography seem a bit duff given how poor they are with their rocket co-ordinates, and without English, how will they read the duty solicitors "Guide to English Racism" booklet, before they get back out and onto welfare as usual? No-May and her useless crew seem intent on making us read our own death notices in Arabic. More fool us if we let her. This makes me wonder what US tax dollars are going for. We should demand an accounting of what we are paying for as well. I guess the Brits don't care. I think some of us here still do. Both the abysmal state of British education and the support of jihadist education among the Palestinians are the result of leftist control of the British government for nearly three decades. There hasn't been a conservative government in the UK since Margaret Thatcher was forced out of office. The Conservative Party leadership has been taken over by the most leftist faction of the party, and while most of their voters and many elected officials can still be classed as conservative, the people who control the party's money and organisation, and serve in Tory governments, are not. Leftist government has made British education largely about socialist political indoctrination (excluding and/or distorting the necessary things that used to be taught), and the leftist alliance with Islam unquestioningly supports anything Muslim, and refuses to contest anything associated with Islam, including indoctrinating children to support terrorism. The problem isn't that British governments don't know what's going on, but that they support it. How right you are there are very few real conservatives in the UK Government. They are mostly conservative in name only. I wish the real conservative politicians would step forward and say so because among the electorate there are many who would support them from both parties in running the UK as it should be. Is anyone surprised at this duplicity of any UK government Labour Conservative no difference. There is never any money to help the working UK population, but always plenty to give to murderers of Jews and Christians by the forever anti-Semitic foreign office and their cohorts. The way to hell is paved with misguided lunatics. Thank you Douglas and Gatestone. From what I have read from various sources on the subject, Great Britian appears to have lost its compass as a nation and as a culture. The only question now becomes that of whether or not they are past the point of no return. To this observer, it appears that they have crossed that point as has most of Europe. You have confused Hooke's Law (F = kx) with Newton's Second Law (F = ma). Just a technical detail, and your overall points are well made. "The same study also stated that for numeracy in the developed world, England ranks second-to-last." Are followers of Muhammad responsible? Hard to believe, since the numbers are Arabic. Has Corbyn made any comments about this piece and if not why not? He obviously supports what's happening in West Bank schools. The true scandal for Britain is that it has as a prime minister, Theresa May, whose pro-Islam policies will eventually deem Winston Churchill's remarks about Islam as persona non grata and candidates for censorship. That the government would refrain from penalizing or dissolving "charities" for funding pro-violence textbooks should not be surprising. She is a two-faced liar busy now selling out Brexit. As usual, Douglas, you are right on the money. I picked up a most illuminating book by David Bedein at a Henry Jackson event a few years ago. It has one example after another of exactly what you are describing in the textbooks. I took up the matter with the Foreign & Commonwealth Office via Matthew Offord MP and the reply from Tobias Ellwood (Under Secretary of State) stated the UK Government and the UN found no evidence of antisemitism in Palestinian textbooks. Talk about heads in the sand!! Thank you for this article Douglas. It is truly shameful of Britain to fund this racist and thuggish curriculum, while failing the education of our own children. But what can be done about it? Any attempt to clean up the Palestinian Authority would no doubt be met by violence on the streets of Britain from enraged Muslims and their friends on the left. Let's not blame the UK alone. The USA has been complicit in similar funding of Palestinian terror for decades as well. Both countries, in addition to many others in the EU are equally culpable for assisting the terrorists. National suicide seems to be endemic in the West? What is going on??? The English are not the only fools doing this, here in Australia we give these thugs millions of our dollars a year too. Geoff, What bothers me now is that this is going on all over the world and nobody wants to see the danger being presented to the democratic societies. Canada has been giving them everything, and taxpayers are sick of it, but our so called PM, Jihadi Justin could care less about what taxpayers think as long as they pay the tab in all his waste, and these things are a complete waste. Here in Canada they get citizenship very fast, all their medical needs met where Canadians can't get it, money to cover their expenses and they still complain, free housing and they still complain, and taxpayers are paying for all this waste that this liberal gov't keeps giving out. Don't ever vote a liberal gov't in or your country will be broke immediately. Yet another example of the lunatic fringe embedded in certain areas of the British government. All paid for by the taxpayers who in the future will become the victims of such idiocy. Education really does vary doesn't? What possesses supposedly, well educated, people in Government to allow this to continue. Don't they actually see the error of their ways? It's incredible to think that this is happening when they know, or should know the aim of Palestinians. I'll be extremely happy to leave this twisted and corrupt planet when the time comes, the future is being laid out in front of these people in government yet they fail to see the stupidity of their actions! A twisted hateful education is taking place, and silly people are overseeing their own downfall and putting their own people's futures at risk. Worst of all is the fact that this stupid government is forcing the British people to fund their own demise! Jeff, this is not idiocy or stupidity. There is an obviously sinister goal behind this behaviour. Stay tuned. That England is dead last is not astonishing in the least. All one has to do is interact with the younger generation(s) and it's as clear as can be. The PC liberal progressives have cobbled up pretty much all aspects of the liberal western cultures and it's only getting worse. Thank you Douglas. Once again you have given important information that is invaluable. Why does Britain allow this to happen? To financially support any approval of terrorist inspired martyrdom against the Jewish people or the State of Israel is a clear manifestation of anti-Semitic activity by association. This is utterly shameful. Many children being indoctrinated in this way will become active terrorists as they grow up and may well pose a threat not only to Israel but to western society including Britain. We must always remember however that Islam is a religion of peace and that our learned and knowledgeable leaders tell us that terrorism or jihad has no place in Islam. How thankful we should be for such deep insight into Islam that contradicts the Koran!